Video de un bellísimo dormitorio chocolate. Esta remodelación muestra el antes y después de un espacio que se convirtió en un hermoso lugar para dormir y disfrutar, del programa de tv Divine Design (Diseño Divino) que conduce Candice Olson. Nótese la elegancia que dan los cojines de piel, el cojín rosa satinado, la alfombra negra imitación piel de oso y las fotos impresas colocadas en cuadros dentro de la habitación sobre todo en la cabecera de la cama. La diseñadora del bello dormitorio marrón: Candice Olson Diseño Divino. En este dormitorio para dama, se usa espejos sobre las puertas para eliminarlas visualmente. 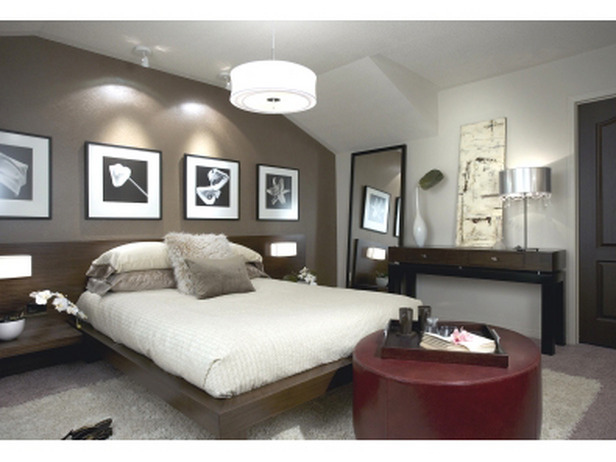 Candice Olson's Divine Design: Lofty Expectations Our makeover magician turns an unsightly attic into a sleeping beauty. After decorating the nursery and giving their suburban town house a child-friendly decor, new parents Tatiana and Dimitri decided they needed a master bedroom where they could escape for quality time on their own. A 22-by-13-foot attic offered the space and privacy, but with one tiny window and six builder-basic doors (four closets and two entryways) interrupting the walls, it was a design challenge.Fortunately, Candice Olson saw the possibilities. She began by dividing the room into two zones: one for sleeping and another for lounging. A custom platform bed with a 10-foot-long headboard against one wall defined the sleep area. Then Olson carved out a reading/daydreaming nook, replacing a desk that previously occupied the windowed alcove with a comfy chaise. “No one wants to think about work when they’re trying to sleep,” she says. 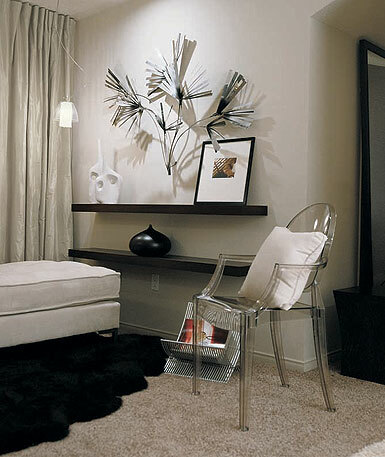 A soothing palette of taupe, beige, and dark brown unifies the room. For added punch, Olson concealed the closet doors behind mirrors. “It’s all so beautiful, like a chocolate heaven,” says Tatiana. Sweet dreams indeed. 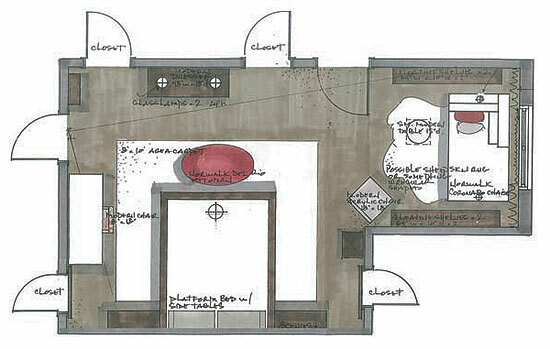 Opposite the entry door, Olson and her team centered a king-size custom platform bed made of walnut-stained mahogany. At just 1 foot off the ground, the unit—with built-in end tables for a streamlined look—makes the 8-foot ceilings appear higher. 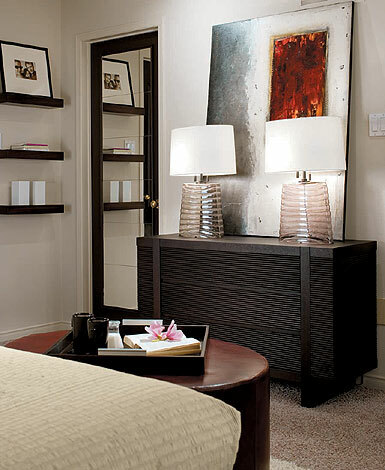 For illumination, each side of the sprawling headboard is fitted with a simple sconce. The entire structure rests against a shimmery backdrop of hand-stamped bronze metallic wallpaper. To imbue this windowless part of the room with a sense of nature, the designer hung four black-and-white photos of flowers. She also livened the bed by mixing textures: a puckered coverlet, smooth silk shams, and faux fur and velvet throw pillows. To break up the straight lines of the furnishings and add a shot of color, Olson placed an oval raspberry-hued leather ottoman at the foot of the bed. To make the alcove’s 3-foot-square window appear larger and also visually heighten the room, Olson swathed the entire 8-foot-long wall with floor-to-ceiling sheers and taupe silk drapes. A 5-by-3-foot chaise lounge upholstered in a creamy silk- and-cotton blend is tucked in front of the window. 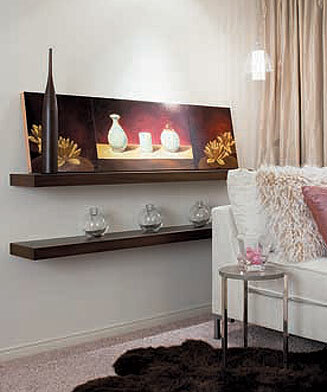 Art objects rest on space-saving floating shelves. Two dainty glass-and-bead pendants provide reading light, while a brown-dyed faux sheepskin rug sets this nook off from the adjacent sleeping area. “In tight quarters, it’s important to choose small-scale items,” says Olson. For instance, a mini end table—a limestone disc on three nickel legs—is the perfect size to hold a drink or two. With the addition of a Louis XVI–style see-through acrylic chair near the foot of the chaise, the alcove doubles as a cozy conversation area where Tatiana and Dimitri can read or catch up at the end of the day. And the barely-there chair can be easily and unobtrusively moved around the room. To add shimmer and sheen, Olson chose reflective finishes; a stainless steel magazine rack holds reading material, and an aluminum sculpture of palm fronds hangs on the right-hand wall, highlighted by a ceiling-mounted low-voltage halogen light. Atop a dark-stained wood dresser, two table lamps sit in front of a shiny abstract painting. The horizontal stripes in the glass lamp bases echo the striations in the dresser; the metallic artwork was chosen to complement the room’s space- and light- enhancing mirrors. In the alcove, left, mahogany shelves—at 6 feet long and 10 inches deep—are roomy enough to display various collectibles; a tall mango-wood vase and the orblike glass vases below it echo the vessel subjects in the rectangular still life. Low-lying ledges on either side of the platform bed, right, serve as nightstands. Under the bed, Olson topped the wall-to-wall carpeting with a cream-colored shag area rug to give the homeowners a cushy spot to step come morning. Me fascina este dormitorio, los detalles de los cojines de diferentes texturas, los espejos, los colores, etc.